KUALA LUMPUR: Embezzlement and bribery with government money are among the charges that Malaysia is looking to bring against former prime minister Datuk Seri Najib Tun Razak following a probe into funds allegedly looted from the state-run fund 1MDB, Tun Dr Mahathir Mohamad said on Tuesday. The Prime Minister told Reuters in an interview that Malaysian investigators already “have an almost perfect case” against the principal suspects who had defrauded 1Malaysia Development Berhad (1MDB) and misappropriated billions of dollars in public funds. He also described Najib, who had founded 1MDB, as playing a central role. “He was totally responsible for 1MDB. Nothing can be done without his signature, and we have his signature on all the deals entered into by 1MDB. Therefore, he is responsible,” Dr Mahathir said. Having retired as prime minister in 2003 after 22 years in power, Dr Mahathir - who is aged 92 - came out of retirement and joined the opposition to topple Najib in an election last month. Following his stunning victory, Dr Mahathir has reopened investigations into 1MDB and Najib’s involvement in its operations. As a result of an anti-kleptocracy probe, the US Department of Justice has alleged more than US$4.5bil was misappropriated from 1MDB and that about US$700mil of that ended up in Najib’s personal bank accounts. Dr Mahathir has barred Najib from leaving Malaysia, and police have searched properties linked to him, while anti-graft investigators have questioned both Najib and his wife, Datin Seri Rosmah Mansor. Najib’s spokesman could not immediately be reached for comment on Tuesday. Investigators are looking to bring “a number of charges” against Najib, Dr Mahathir said, adding those charges would be based on abuse of power when he was prime minister. Dr Mahathir said Rosmah was also being investigated in connection with 1MDB. “Some of the money is believed to have gone to her, lots of money,” Dr Mahathir said. Dr Mahathir said he expected Malaysia to make its first arrest in the 1MDB case within months and “hopefully” start a trial by the end of the year. “We are working as hard as possible at a furious pace. We think that we already have almost a perfect case,” Dr Mahathir said. Low is a Malaysian financier, who is also seen as a central figure in the 1MDB scandal. He is regarded as close to Najib and his family. “When we go to the courts, we will have clear evidence of the wrongdoing. We cannot afford to lose,” said Dr Mahathir. 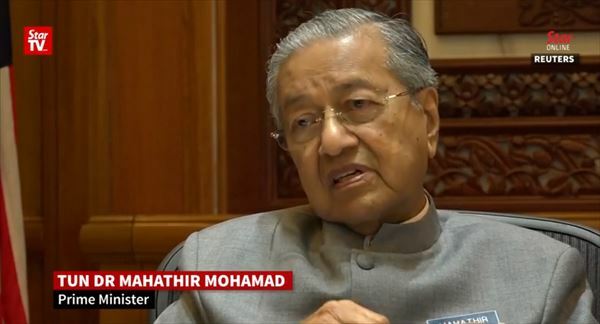 The Prime Minister said Low had contacted him to try to make a deal on 1MDB - seeking protection from prosecution in exchange for providing information, but Dr Mahathir said he had turned down the offer. Dr Mahathir’s promises to root out corruption and punish those responsible for the 1MDB fraud was central to his successful campaign to unseat Najib’s Barisan Nasional coalition that had ruled Malaysia for over 60 years until last month. Malaysian investigations into 1MDB were essentially shut down during Najib’s premiership after the then-attorney general - who was sacked by Dr Mahathir in his first few days in office - cleared him of any wrongdoing even as at least five other countries continued their own investigations. US investigators had regarded Najib’s government as obstructive, sources have said. Swiss Attorney General Michael Lauber said last year that Malaysian authorities had refused to cooperate. Dr Mahathir on Tuesday said he was confident of recovering “quite a lot” of the lost 1MDB money, adding Malaysia will look into why Goldman Sachs was paid almost US$600mil for helping 1MDB issue debt, an amount that critics say exceeded a normal level for fees. Goldman raised nearly US$6.5bil in three bond sales between 2012 and 2013 for 1MDB. Dr Mahathir, who turns 93 next month, is the world’s oldest prime minister. Aides, political allies and Dr Mahathir himself say he has been working long hours in his first six weeks, belying his age. His stint as premier this time around is harder, said Dr Mahathir, in part because of the challenge of rebuilding and restaffing key ministries. Dr Mahathir said he also understood he could not make a clean sweep of suspected corruption and keep the government running, as it was hard to find “reliable people” to fill posts.